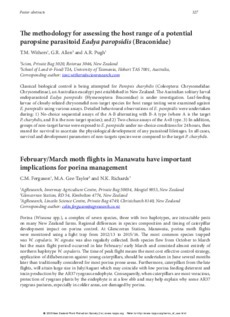 Classical biological control is being attempted for Paropsis charybdis (Coleoptera: Chrysomelidae: Chrysomelinae), an Australian eucalypt pest established in New Zealand. The Australian solitary larval endoparasitoid Eadya paropsidis (Hymenoptera: Braconidae) is under investigation. Leaf-feeding larvae of closely-related chrysomelid non-target species for host range testing were examined against E. paropsidis using various assays. Detailed behavioural observations of E. paropsidis were undertaken during: 1) No-choice sequential assays of the A-B alternating with B-A type (where A is the target P. charybdis, and B is the non-target species); and 2) Two-choice assays of the A+B type. 3) In addition, groups of non-target larvae were exposed to E. paropsidis under no-choice conditions for 24 hours, then reared for survival to ascertain the physiological development of any parasitoid lifestages. In all cases, survival and development parameters of non-targets species were compared to the target P. charybdis.